Cultivating New Frontiers in Agriculture (CNFA)’s Farm Service Center Project (FSCP) under the GIZ Green Innovation Centres for the Agriculture and Food Sector (GIAF) Ethiopia portfolio is organizing a Grant Signing Ceremony for three competitively selected grantees who will be establishing Farm Service Centers (FSCs) in Assela, Iteya and Robe towns of Arsi Zone, Oromia region. 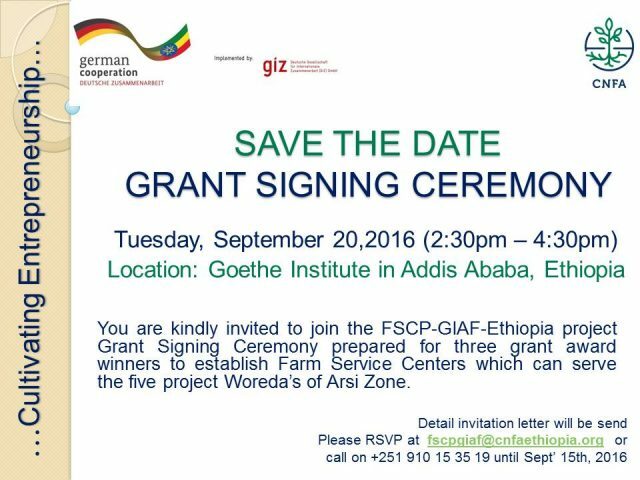 The ceremony will be held on Tuesday, September 20, 2016, at Goethe Institute in Addis Ababa from 2.30PM – 4.30 PM. During the event, the FSC model and the project grantees will be introduced and the grant agreement will be signed in the presence of senior government officials, GIZ GIAF-Ethiopia Program Manager, representatives from different NGOs, input suppliers, and other stakeholders. Farm Service Centers (FSCs) are market-based one-stop shops that are owned and operated by private and/or cooperative entrepreneurs. These FSCs supply a range of farm inputs, implements, knowledge, and services to link smallholder farmers with new agricultural technologies, innovations and best practices to improve on-farm productivity and household income. Cultivating New Frontiers in Agriculture (CNFA) invites you to join us for an interactive discussion on how partnering with the private sector will play an increasing role in global economic growth and agricultural development. Reception to follow from 4:00 – 7:00 PM. Vasile Bumacov, who served as the Minister of Agriculture and Food Industry for the Republic of Moldova from 2011 to 2015, is one of Europe’s foremost authorities in agriculture. In the past, Bumacov’s expertise in Moldova’s high-value agriculture (HVA) sector proved an invaluable asset to CNFA throughout the implementation of our Agribusiness Development Project, a $12.5 million USAID-funded program that improved the international competitiveness and trade performance of the country’s HVA sector, ultimately increasing rural incomes and employment. Bumacov is also a prolific agricultural engineer, having authored 56 scientific publications and developed numerous advancements in agricultural technologies. He holds a PhD in Technical Sciences and a PhD in Agricultural Engineering, both from the Agrarian State University of Moldova. Presently, Bumacov is acting as the Technical Director for a Japanese-funded project that aims to increase food production in Moldova by using modern agricultural machinery, lowering the production costs and improving growing technologies. Learn more about the project here: http://www.2kr.md/. Jason Huffman is the agriculture and trade editor for POLITICO Pro. Huffman joined POLITICO Pro in July 2013 after serving five years as the editor in chief of Food Chemical News. Previously he worked more than 17 years at United Communications Group, serving at the helm of more than a dozen award-winning information services, including those covering bank regulation, home health care and telecom. He started his journalism career by working about five years as a beat reporter for community newspapers in the Baltimore area. Huffman grew up in a rural part of Pennsylvania, not far from the Maryland line, working summers for his grandfather and uncles in their respective hay, straw and fertilizer businesses. He is a Lycoming College graduate, married and has two children. Rob Smith is AGCO’s Senior Vice President and General Manager, Europe, Africa and Middle East. In this role, Smith is responsible for reinforcing AGCO’s leading market position and further expanding the company’s manufacturing footprint in those regions. Smith has extensive international management experience and most recently was the Vice President & General Manager of the global Engine Components Division for TRW Automotive – one of the world’s largest automotive suppliers. He also was the Chairman of the Supervisory Board of TRW Automotive GmbH. Prior to this, Smith served as Vice President of the Global Automotive Division at Tyco Electronics, and Vice President & General Manager of the Aftermarket Parts and Material Repair and Overhaul business at Bombardier Transportation. Rob began his career as a Combat Engineer Officer in the United States Army. Smith earned his MBA from the University of Texas at the Austin Graduate School of Business. He received German Diplom-Kaufmann and Doctoral degrees in International Operations Management from the WHU – Graduate School of Management in Koblenz, Germany. Learn more about AGCO here: http://www.agcocorp.com/. Serving as the president and chief executive officer of CropLife America (CLA) since 1989, Jay Vroom is a longstanding leader and advocate for the agribusiness industry. Under his guidance, the CLA trade association based in Washington, D.C., has been a driving force behind crop protection regulation as well as a strong proponent of crop technology in enhancing food, fiber and renewable fuel production. Vroom is also a founding member and original chairman of the CropLife Foundation, an affiliate organization which he currently serves as Vice-Chair. Prior to joining the CropLife staff, Vroom has held various positions in executive capacities with the Fertilizer Solutions Association (now the Ag Retailers Association), the Merchants Exchange of St. Louis and The Fertilizer Institute. Vroom was a member of the youth organization, Future Farmers of America, and graduated with honors from the College of Agriculture, Consumer and Environmental Sciences at the University of Illinois Urbana-Champaign. He still owns the grain and livestock farm that he grew up on, located in north-central Illinois. Learn more about CropLife America here: http://www.croplifeamerica.org/#section-1. The closest metro stations to the District Architecture Center are Archives-Navy Memorial Penn Quarter station (Green/Yellow lines), and the Gallery Place Chinatown station (Red line). Follow I-66 East toward Washington DC, Proceed over the Theodore Roosevelt Memorial Bridge to enter Washington DC, Follow signs for US 50 East / Constitution Avenue NW, Proceed East on US 50 East / Constitution Avenue NW, Turn left onto 7th Street NW, DAC is located 3 1/2 blocks on the right. Follow I-395 North toward Washington DC, Proceed over the George Mason Memorial Bridge to enter Washington DC, Take the 14th Street SW or 12th Street SW Exits North toward the National Mall, Turn right onto US 50 East / Constitution Avenue NW, Turn left onto 7th Street NW, DAC is located 3 1/2 blocks on the right. Follow I-270 South toward Washington DC, Take the Capital Beltway I-495 West toward Northern Virginia Follow signs for George Washington Memorial Parkway, Take the George Washington Memorial Parkway Exit South toward Reagan National Airport, Take the 14th Street SW (George Mason Memorial Bridge) Exit North toward Washington DC Proceed over the George Mason Memorial Bridge to enter Washington DC, Take the 14th Street SW or 12th Street SW Exits North toward the National Mall Turn right onto US 50 East / Constitution Avenue NW, Turn left onto 7th Street NW, DAC is located 3 1/2 blocks on the right. Follow I-95 or Baltimore-Washington Parkway 295 South toward Washington DC, Follow signs for US 50 West / New York Avenue NE, Take New York Avenue NW South Pass over North Capital Street NE, Turn left on 7th Street NW at Mount Vernon Square / Convention Center, DAC is located 6 1/2 blocks on the left. If you have questions, please feel free to call our office at 202.296.3920 or send an e-mail to comintern@cnfa.org. Cultivating New Frontiers in Agriculture (CNFA) and ADRA International will discuss ongoing activities in the Zimbabwe “Amalima Project” and Democratic Republic of Congo “Jenga II project” respectively on June 11, 2015. Join CNFA and David Brigham, Country Representative for Zimbabwe and CNFA and Chief of Party, at the Society for International Development (SID) hosted event for broader discussion on increasing access to financial services and markets to improve agriculture and food security in Africa. In Zimbabwe, CNFA leads a consortium of partners including the Organization of Rural Associations for Progress, Africare, Dabane Water Works, International Medical Corps, and the Manoff Group to increase productivity, improve drought resilience and adaptation, and enhance nutrition care practices in Zimbabwe’s Amalima program. Amalima applies a set of innovative approaches by building on existing communal initiatives and solidarity to address food and nutrition insecurity and strengthen resilience to shocks. The project targets over 66,000 households, leveraging community-led approaches to increase productivity, improve drought mitigation and adaptation, and apply market-led approaches to push and pull vulnerable households into profitable value chains by streamlining cereal marketing from surplus to deficit areas. The project also is enhancing nutrition care practices by providing a combination of capacity building, training and mentoring, food rations, vouchers, tools, matching grants, and community-based messaging and mobilization to achieve its expected results. Provide a venue to display a number of exhibitions supporting environmentally sound technologies, services and agro-inputs in enhanced agricultural, fishery and animal husbandry productivity presented by domestic and international companies, NGOs, projects and other fair participants. Bring together fair attendees from various sectors such as domestic distributors, wholesalers, retailers, farmers, and other potential buyers of state-of-the-art, environmentally sound, high-quality products. Promote innovation and development in quality seed, fertilizer, aquaculture and animal husbandry feed and technologies, agro-tech machinery, environmentally sound quality crop protection products, soil enhancers, Information and Communication Technologies (ICT), as well as cash transfer, and financing mechanisms. Encourage industry-wide learning about state of the art products, resources, services and innovation to inform and improve agriculture, fisheries, and animal husbandry practices. To learn more about the event or interested in participating, please click here. Find out more information about a series of regional livestock investment forums that the USAID Agricultural Growth Program-Livestock Market Development project is hosting in September and October 2014.